Home / News / CCW Badges? We Don’t Need No Stinking Badges! Today a bill was filed in NC for an extra special concealed carry permit that would basically allow permit holders to ignore all anti-ccw signage in the state… and… it would require them to carry a CCW badge issued by their sheriff. CCW badges are dumb, even if the bill would require them. Its SB708 and its called the Homeland Security Patriot Act. I almost feel like Senator Tarte is just trolling us with this. Oh goody! Can I hang it around my neck? LOL! If the State can regulate a business in the first place, why can’t the State just change the law so the business CANNOT prohibit concealed or open carry? I would fight that tooth and nail. If its my house, I get to make the rules. Don’t like my rules, don’t come to my house. Where in my comment do you see the word “house”? I said “business”, and if I see a “No Gun” sign on that business, they don’t get my money. Same difference. If I own the business, I make the rules. If you don’t like the rules, don’t shop at my business. That’s how a free market works. The government has no business telling a business that they cannot ban something from their property. Any move in that direction would be a huge overreach. 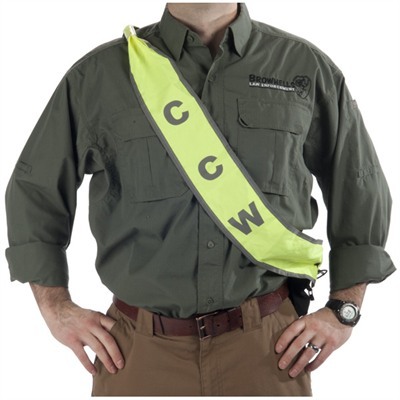 So, those internet derp ccw badges are one thing, but does this proposal require you to *display* it? If not, aren’t you kind of getting the privilege like a plain-clothes deputy? As long as this doesn’t *replace* regular ccw, what is the actual problem? Can’t LEO’s already carry past the “no guns” sign? A business can ban a “thing” but they can’t ban a “person” can they? Can you ban a wheelchair (a “thing”) from your property? Really, “bans” are stupid things. Name one thing, anywhere, ever, that is banned, but does not exist. Edited – oh, yeah, there, I followed the links to the bill. That is pretty much exactly what it does – deputize the holder. No requirement to display. Granted, anything named the “Homeland Security” “Patriot” anything bill is open for scepticism, what is your actual issue? No, it doesn’t deputize the CHP holder. Not even close. It doesn’t deputize the holder. The holder still won’t be able to bind someone, kidnap them, and put them in a cage. Or shoot them and get away with it. 2. The badge is unnecessary, silly, adds cost, and serves no purpose. 4. A business can ban a person, as long as they aren’t banning protected classes, which is a whole other topic. 5. You are correct, prohibition does not work. so Lucas you think business owners should be able to restrict your 2nd amendment rights? They can’t deny you service because of your 1st amendment rights (religion) or what race you are or if you are disabled or not. Nor can you ban someone because they voted in the last election. So why is the 2nd amendment somehow different in that businesses can tell you to leave if you are exercising your 2nd amendment rights? All rights should all be treated the same. Their house, their rules. I’m one of those crazy libertarians that thinks a business owner should be able to dictate pretty much whatever he wants to do on his property. I will grant you that it does not give the holder arrest powers etc. But you haven’t answered any questions about what you don’t like. Being able to carry the same places that cops can carry is a far cry from being deputized. So, your problem is the little piece of metal, not the “some are more equal than others” concept? I’m not being obtuse, but if they removed the badge part, would that make it ok? I think not. If your problem is (rightly) that the bill restricts property owner rights – attack that, not a little piece of metal. Or paper. Of course, Indiana is currently having a little trouble along these lines, too! As I said above earlier, I disagree with restricting property owners rights. I also disagree with the badge. I like expanding CCW rights, but this bill isn’t the way to do it. I saw one of those CCW badges at Bass Pro in Myrtle Beach for $25 with a wallet. NO WAY I am going to advertise I am carrying! Easy to laugh at the idea, but having a badge can keep you from being shot by cops after the balloon goes up. I’m a retired PI in Florida. I carried a badge for just that contingency. Although I never had to use it to keep from being shot, it did immediately deescalate situations where cops were called about the ‘suspicious guy in a car’ up the street from a surveillance. Its so cool to be against CCW badges… all the really cool guys know how bad they are, so show you are cool too. Don’t ask why. Just accept their opinion as an incontrovertible fact and don’t question the belief, don’t ask for reasons, just FOLLOW LIKE A SHEEP so you will not be demonized, disparaged or humiliated. A CCW holder with < 24 hours of training can ignore any "no guns allowed" sign, but retired cops, like myself, who have been through academies and a career of trust by the populace to responsibly carry a weapon have to leave our gun outside because LEOSA allows these gooberheads to make their own judgment call?! Look, I'm all for furthering 2A rights, but it's easy to see how these things get shot down when you look at them objectively. Remove restrictions that make common sense first and then there isn't much of a leg to stand on. Why couldn’t retired LEOs just go get this extra special permit like the rest of us? It’s still taking a right I was born with away and selling it back to me.